Shouldn’t There Be More to Casino Games? Rife with possibilities, %%% % % % this setting should be worth more than it is. Ian Fleming was hardly the first author to use a casino setting in his writing, but he is arguably the most famous. His descriptions of the Monte Carlo Casino in Casino Royale remain to be some of the best – something that writers continue to strive for to this very day. For all of the publicity that Fleming has brought to casinos, however – not to mention all their reputation as luxurious places for the rich and famous – casinos have hardly been given much notice in the world of video games. Although the world has seen an active online casino gaming industry since the launch of InterCasino in 1996, gameplay has been more or less the same. Casino games are overly simplistic, and there’s not much for players to do other than log onto their accounts and start spending money. Games like GoldFire’s CasinoRPG have tried to take casino games down a different path, allowing for some degree of customization and socialization. But then, story lines in casino games remain to be quite limited, if not linear. And in a world of free-roam and free-world MMORPGs and games like Grand Theft Auto proving time and again that a world of limitless possibilities can be achieved, the lack of a great story sets casino games up for failure. Today’s game development scene is unique in that Kickstarter and other crowdsourcing techniques now allow developers to produce less conventional games. Without having to worry about worldwide sales and sponsorships, independent developers are free to experiment with different combinations of genres, resulting in games like Poker Knight being developed. But rather than creating a game that has some elements of casino games integrated into its battles, why not create a game centered around a casino experience? Developers should take Fleming’s descriptions of the experience of playing in a high-end casino as a challenge, and seek to recreate this experience in a video game. Rendering some of the best, most beautiful casinos into a 3D game, developers should be able to begin setting up the stage for some of the gaming industry’s most intense, emotional scenes. Players should be able to speak to each character in the casino and slowly get to know them, with each NPC having its own back story and personality. Of course, the player himself should also be interesting, and not just the bland piece of cardboard that most protagonists often end up becoming. As they play along, they discover more about the character they’re controlling, and more of their quest is revealed to them. Game developers could take things to the next level by creating a game not just set in a casino, but in a city like Las Vegas, where casinos are the star attractions. 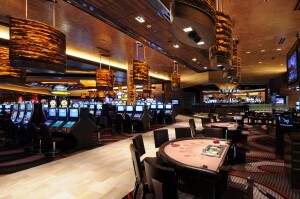 Moving from casino to casino, players can begin to make a name for themselves, all while following an engaging plot and encountering interesting characters along the way.